Caltech, Imperial College London & South Korean scientists have just developed an autonomous flying drone that herds birds out of airspaces. They investigated the problem of flocking birds hitting aircraft, which happens daily, putting passenger lives in danger. They've developed a robotic aerial device - a robo bird that herds. Their research was inspired by the "Miracle on the Hudson" - the US Air jet hit by birds that the pilot landed on the Hudson River. 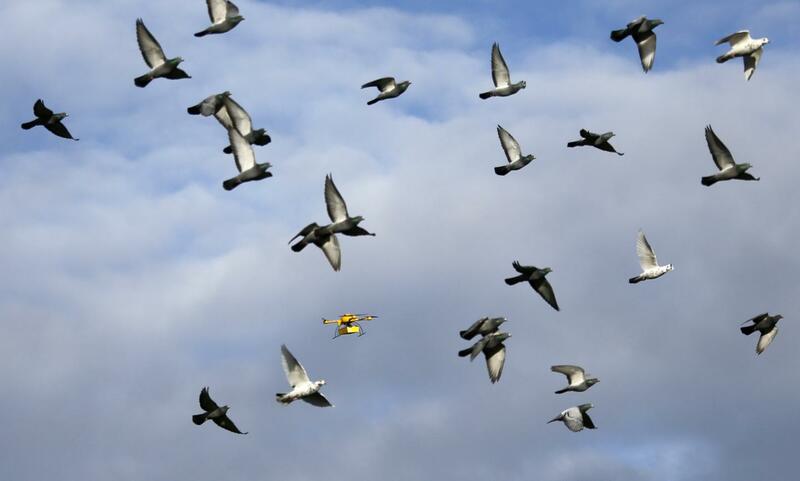 Just one of the new drones can redirect an entire flock of birds. It has a new herding algorithm. The algorithm enables a flying drone to herd a flock of birds away from an airspace without hurting them or breaking their formation. The scientists and engineers created the algorithm by carefully observing flock dynamics and how the flock interacts with flying objects. The herding drone was successfully tested in South Korea by scientists at the Korean Advanced Institute of Science and Technology. It will improve safety in protected airspaces and help to prevent incidents like the one in 2009. Canada geese knocked out 2 engines on a US Air jet, forcing the pilot to land in the Hudson River.